Location: Main Library, Rines Auditorium Audience: Kids & Families, Kids Programs, Early Literacy The Kids Are Alright is a family friendly local music series aimed at encouraging children’s involvement in the musical arts. Mo Nichols will be performing today. This program is intended for children ages 3-7 and their families, but all are welcome! Location: Main Library, Sam L. Cohen Children’s Library Audience: Teen Health, Kids Programs Emmie the Golden Retriever will visit the Library to encourage children to read and to be a furry, fun listener. Contact the Sam L. Cohen Children's Library to make an appointment to read to Emmie! Location: Main Library, Sam L. Cohen Children’s Library Audience: Kids & Families The Sam L. Cohen Children’s Library hosts a monthly book club for girls ages 9-12. Smart Girls Read @ PPL book club provides a forum where girls can explore what’s on their minds. Meets at 1:00 this month only - in order to meet with the author. Location: Main Library, Sam L. Cohen Children’s Library Audience: Kids & Families, Kids Programs Come meet and read to an animal from the Animal Refuge League of Greater Portland. The animal will either be a dog, cat, ferret or a rabbit! Location: Main Library, Sam L. Cohen Children’s Library Audience: Kids & Families Come join a community of readers that meets once a month to enjoy some lively conversation about literature and share yummy (and wholesome!) snacks. This book group is for children ages 9-12. 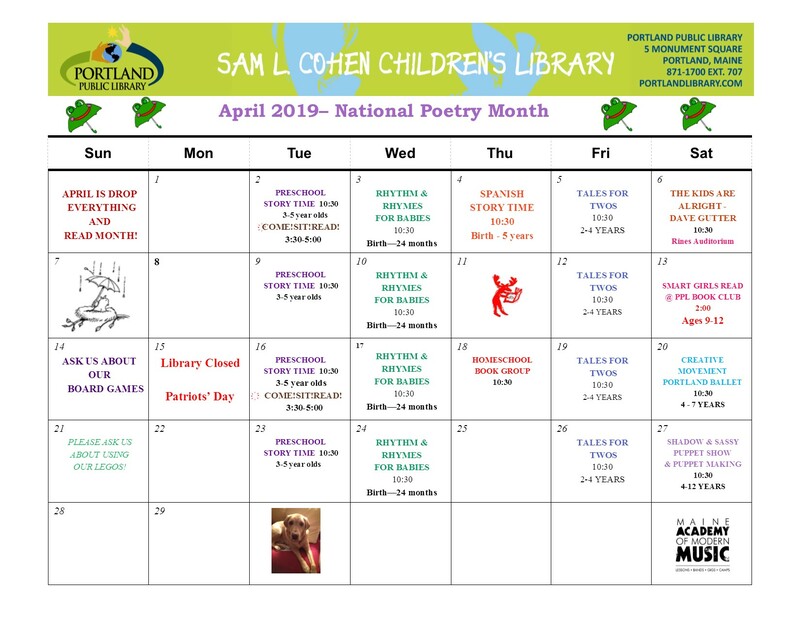 Location: Main Library, Sam L. Cohen Children’s Library Audience: Kids & Families The Sam L. Cohen Children’s Library is delighted to present a Creative Movement class taught by teachers and students in Portland School of Ballet’s Young Dancer Program for children ages 4-7.